1. What kind of king was Ahab? 2. What do we learn about Jezebel and her background? 3. What did this royal couple do to provoke God’s anger? 4. Why was Ahab unhappy? What did his behaviour show about his attitude to his people? 5. What would be the response of a godly wife at this point? 6. How did Jezebel respond? What laws did she break? 7. How was Jezebel’s treachery similar to what happened to Jesus in Matthew 26:57-68? 8. Sometimes evil seems to prevail and innocent people suffer. How do we cope when confronted with injustice? 2. How did Ahab respond to God’s anger and what was the result? 3. How was Jehoshaphat’s approach to ruling Judah different from Ahab’s rule over Israel? 4. After Ahab’s death, what kind of king was his son Ahaziah? 5. What was God’s judgement on Ahab’s wife and sons? 6. What was Jezebel’s response to God’s judgement? 7. What can we learn from Ahab and Jezebel about authority, responsibility and humility? From the moment her marriage to prince Ahab thrusts her into the intrigues of palace life, Jezebel’s exotic beauty opens doors and her will breaks down walls. Torn from her homeland and wed to power in a strange country, Jezebel vows to create a legacy and power all her own. Some might call her a manipulative schemer, bent on having her way. But they don’t know the whole story, and she was much, much worse. As she moves through the halls of power, her heart struggles between devotion to the gods she worships, the prince who loves her, and her thirst for revenge. She sparks a battle between her strangely powerless gods and the God of palace administrator Obadiah—a God who confronts her with surprising might. She will fight, though victory may cost her everything. 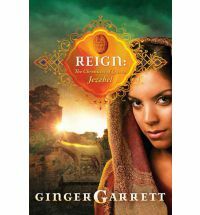 Narelle: I found Reign a fascinating story to read. It was a little confronting to walk in Jezebel’s shoes as she became the princess and ultimately queen of Israel with her husband, Ahab. Her despicable and evil acts including idolatry, child sacrifices and killing the Lord’s prophets are covered in the book. We gain an insight into her hatred of the prophet, Elijah, and her unquenchable desire for power. Ahab is stuck in the middle. He is unable to please his wife and the people who have remained faithful to the Israelite God. He allows Jezebel to encourage the Israelites to worship her foreign gods. Both Ahab and Jezebel suffer the consequences of God’s wrath and judgment. We are given a fictional perspective on their dysfunctional marriage and family life, and plausible reasons to explain their life choices. I recommend this book to those looking for insightful and challenging Biblical fiction. Many thanks to NetGalley and David C. Cook for providing a review copy. In our series of studies about people of the Old Testament we have met great men and women of inspiring faith. We have also seen their human failings, and sometimes these are easier for us to relate to. Through their stories the greater story of God’s redeeming love and faithfulness has been evident. The subject of this month’s study, however, is a couple who did not have an inspiring faith in God. In fact, despite being the rulers of Israel, King Ahab and Queen Jezebel worshipped Canaanite gods, like Baal and the goddess Asherah. They are a study in “How Not to Live”. Their story reads like an ancient soap opera. It would be comic, if they had not been responsible for leading God’s people. Jezebel was a thoroughly modern woman, ahead of her time. Liz Curtis Higgs sums it up well in “Bad Girls of the Bible”, calling her bold, courageous, assertive, intelligent and proud. She was a strong woman of royal descent, born to leadership. She was also a devious, murderous, idolatrous, ruthless, domineering, power-hungry megalomaniac. Jezebel had no respect for her husband, the people of Israel, their laws or their God. She was the daughter of the High Priest of Baal and indulged in witchcraft. Jezebel, queen of Israel, was the Old Testament poster child for why one should not marry outside of the faith. 1 Kings 18:4 also tells us that Jezebel was systematically killing off the Lord’s prophets in an effort to quell the voice of the Lord, which led to a somewhat awkward moment when Jehoshaphat, king of neighbouring Judah, was visiting. Rather than be happy listening to the Baal-serving yes men produced by Ahab, King Jehoshaphat wanted to inquire of God concerning whether a battle should be fought. Ahab’s one and only redeeming quality was that when faced with God’s wrath Ahab did humble himself for a time, and God’s incredible mercy was revealed. This family also experienced God’s fearful judgement. These themes of judgement and repentance are further explored in the second of the “Messages from the Messiah” series with a three part study exploring The Message of Repentance. Narelle here. In August we are giving away free copies of our Ahab and Jezebel Bible Study Leader’s guide to our blog readers. Smashwords may ask you to sign in or set up an account to enable the eBook to be stored in your Smashwords account. You can download the eBook in multiple formats including PDF, Epub and .mobi for Kindle. If you’re wondering how to transfer a Smashwords eBook to your Kindle, please refer to my blog post How to read eBooks from Smashwords on Kindle Enjoy! Below is a brief historical outline from Abraham to Jesus to help put our People of the Old Testament Bible studies into context. The Patriarchs: Abraham, Isaac and Jacob were the fathers of the nation that came to be known as Israel. Jacob (renamed Israel) had 12 sons and his descendents became the 12 tribes of Israel. They settled in Egypt around 1876 BC. Moses and the Law: Moses led the Israelites out of slavery in Egypt around 1446BC. After 40 years of wandering in the desert, the generation who had rebelled against God and worshipped the golden calf had all died (other than the faithful Joshua and Caleb). Moses gave the people God’s law but did not enter the Promised Land. Joshua led the people into Canaan. The Judges: For 480 years God’s people were ruled by Judges. Samuel was the last. The Golden Age of Israel: Kings Saul, David and Solomon reigned over the united kingdom of Israel from 1050-930BC. Psalms and Proverbs were written during this period. The Divided Kingdom: The Kingdom split into the Northern Kingdom (Israel) and the Southern Kingdom (Judah), which maintained the dynastic line of David and contained the holy city of Jerusalem. Elijah, Jonah and Amos were prophets of this period. The Fall of the Northern Kingdom 722BC: The Assyrians conquered Israel. Isaiah and Hosea were prophets during this period. The Fall of Jerusalem 586BC: The people of Judah were taken into exile in Babylon. Jeremiah was the prophet of God’s judgement. Daniel and Ezekiel were written during the exile. The Restoration 538BC: When Cyrus, king of Persia, conquered Babylon the Jewish exiles returned under Ezra and Nehemiah to rebuild Jerusalem and the temple. Esther and Zechariah were also written during this period. The Birth of Jesus the Christ 5 BC: Now under the rule of the Great Roman Empire, Israel awaited the promised Messiah, born in Bethlehem in the line of Judah. This very sketchy history, including all the dates, was gleaned from the very useful notes in the Zondervan NIV Study Bible, especially the historical timeline.